Mixing the sound of plucked strings with the inflections of the voice, delicately supporting the voice with a chord, with a note, or to the contrary, giving to the singer a rhythmic energy that he wouldn't find alone, that has been done since the beginning of time. Whether it was the ancient lyre, the harp of the trouvères and the troubadours, the lute of Ronsard's contemporaries or the theorbo of Caccini and of Lambert, the principle has always been the same: to create a space where the voice is free, where the words are sung out and clearly heard, and the poetry reaches and touches the listener. 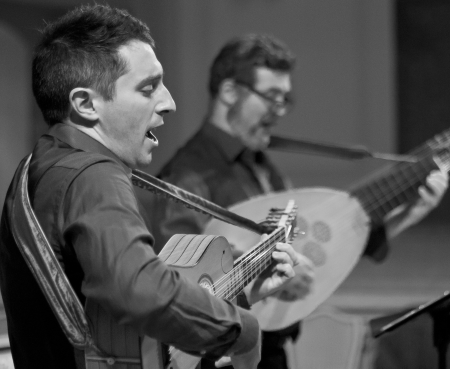 Francisco Mañalich and Marco Horvat belong with those very rare contemporary performers who have taken up the torch of the traditional lute singer. Marco Horvat has been doing it for years in accompanying himself on the lute, the theorbo and the lyre. In a very original way, Francisco Mañalich, a young singer and instrumentalist, accompanies himself on the bass viol; while the instrument was said in the 17th century to be appropriate for self-accompaniment, no one else has ever used it to this end. These two musicians with voices and instruments that complement each other were destined to meet one day and design a program according to their own measurements, where the numerous combinations of voice and instruments they are prone to create would serve the right repertoire.